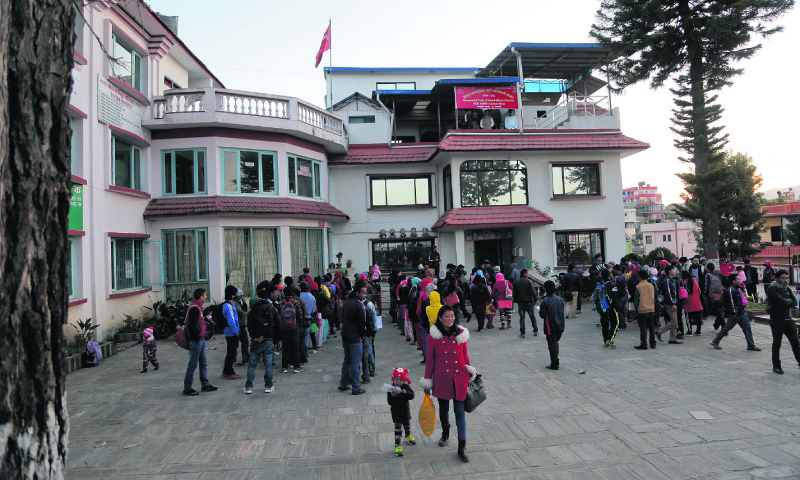 KATHMANDU, May 7: Pushpa Kamal Dahal's decision to form a bloated organization has come back to haunt his party, the CPN (Maoist Center), as it intensifies work to pick around 200 candidates from among its 4000-member strong central committee to be integrated in the to be unified party. After 'breakthrough' in unity talks with CPN-UML Chairman KP Oli, Maoist Center Chairman Dahal on Thursday had directed the party's provincial committees to recommend around 200 names for appointment in the central committee of the new party. The new party which has been named the Communist Party of Nepal is expected to have a 400-member strong central committee. Although the exact shares the two parties will have in the CC remains unclear, leaders say that the Maoist Center is likely to have somewhere between 150 to 175 members in the new CC. While all CC member of the CPN-UML will hold their current positions in the new party, 19 out of 20 CC members of the Maoist Center face the risk of expulsion. The expulsion was perhaps expected as Dahal had formed a jumbo committee in a bid to appease ten offshoots of the former rebel party to return to the mother party. The party currently has around 4,000 central committee members, twenty times higher than that of the central committee of the CPN-UML. Although Dahal had disbanded the committee and announced to replace it with a new one before the three tiers of elections, it has yet to happen. As the party begins efforts to downsize its CC, thousands of leaders vying to retain their status in the new party have begun relentless lobbying. Party's provincial chiefs say that the internal discord over positions in the new party is expected to further delay the unification process. The party is expected to face the similar challenge in selecting candidates for the standing committee, politburo and other executive committees. Maoist Center coordinator for Province 5 Mani Thapa admitted that there are some challenges. He said that party top guns including Dahal and General Secretary Thapa will take the final decision once the provincial committees recommend names. The UML and the Maoist Center, which signed a seven-point framework agreement on merger in February, have not been able to finalize their merger due to differences over the share of power. However, Oli and Dahal have already reached an understanding on the share of power the two will exercise in the party and the government. According to leaders briefed on the understanding, Dahal and Oli, who have already agreed on a joint leadership, will also rotate the premiership for two and three years respectively.